Let me tell you something about German winters… they are DARK. Dark and boring and mildly depressing. For most of the year here, the weather is mild and there are all sorts of fests going on that you can visit and the biergartens are open and people are out and about. But for about 3 months from January to the end of March, the sun doesn’t really rise until 8 and sets at 4 and nothing is going on in the city. On top of that, almost every day is completely cloudy. In addition, the warmer weather here means that some flowers are blooming. All in my yard are these pretty wildflowers that popped up, it’s so cheery. On the left, delicate blossoms of our cherry tree. 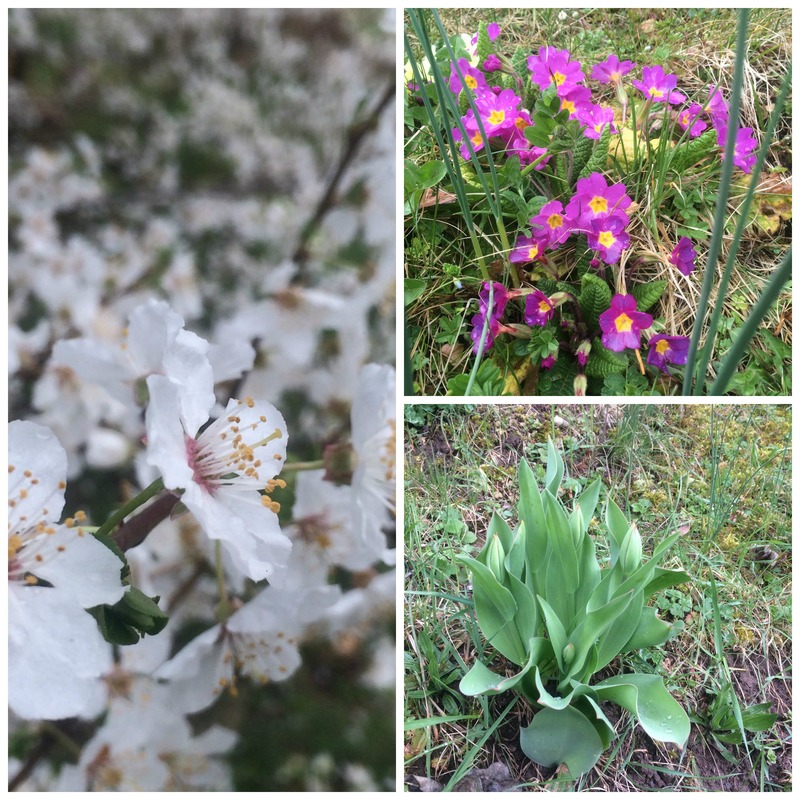 Upper right: the flowers that are in clusters all over the yard in various colors. Lower right: Maybe tulips? These are everywhere and are about to burst. All of this is probably why I have been wanting margaritas and Mexican food and one of my favorites is carnitas. 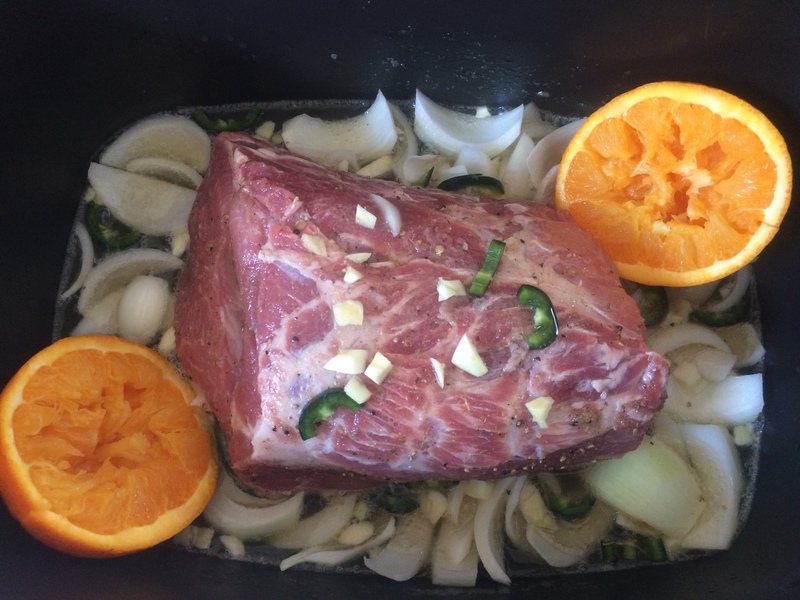 I just love this luscious pork, slow cooked for hours in orange juice, garlic, jalapeno and beer. The versatility of carnitas is also great: it can be eaten as-is, in a bowl with rice and condiments, as a taco or even enchilada filling. An obligatory condiment for me is pickled red onion–the tangy, sharp bite is great with the fatty pork. Pat dry the pork and mix the salt, pepper, cumin and oregano with just enough oil to make a paste. Rub this all over the pork. Put layer of onion in a crock pot and sit the pork on top. Squeeze juice from orange into the pot and add the halves. Sprinkle in the jalapeno and garlic. Pour the liquid of your choice around the pork (avoid dumping it all on top the pork as it will rinse off the spices). Cook on low for 7 to 8 hours, until the pork is easily shredded with a fork. Remove and shred pork and add to a hot pan with some vegetable oil to crisp up the edges. Add pork to a dish and spoon cooking liquid (with onions, garlic and jalapeno) over– you want to add about 11/2 cups of liquid to the pork. Toss together and serve as is, on tacos, as a burrito bowl, in a sandwich…. 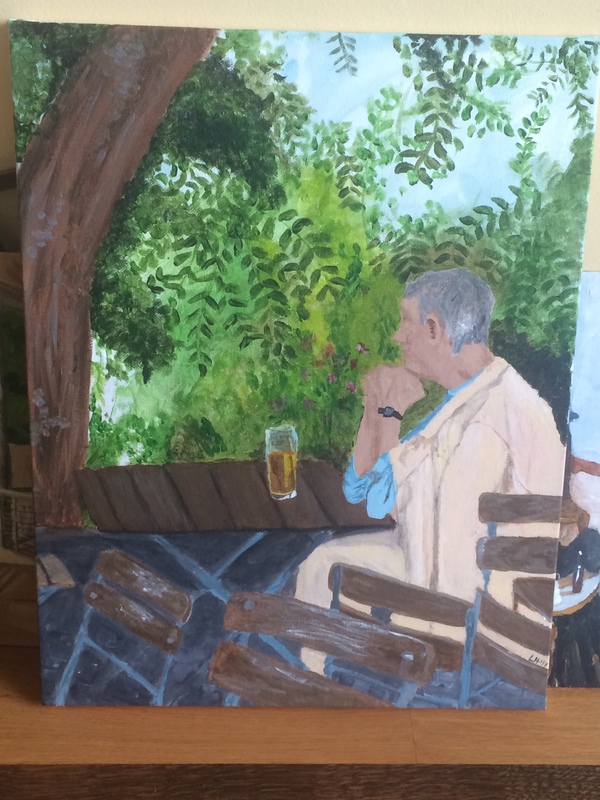 So glad you are out of the dark-your yard looked lovely when we visited & I loved Fruhlingsfest, subbing wine for beer of course. I’m going to try this yummy dish soon!